Last-minute shoppers will have an extra two days to get discounted titles from Steam's annual winter sale. 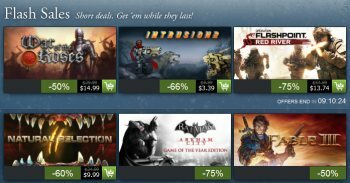 Steam's annual Holiday Sale, which is full of ridiculously good deals and heavily discounted games, has been going on since December 20, so by now you've probably bought all the games you wanted (and possibly games you didn't even know you wanted). If you're the wait-till-the-last-minute type, however, you'll have a little more time to download some beloved games for cheap. The Steam Holiday Sale, originally scheduled to end tomorrow morning, is getting an encore weekend; you now have until Monday, January 7 to finish impulse-shopping. The encore weekend officially kicks off tomorrow, January 5, at 10:00 am PST. The extended sale will feature "a select number of the most sought-after titles from the Steam Holiday Sale," though which titles that refers to isn't clear. Once the encore starts, you'll have 48 hours until the Holiday Sale is really over, after which you'll just have to go back to paying more than a few bucks for video games. Of course, you don't even have to wait until tomorrow morning; you can still get lots of Steam games really cheap right now. However, having those extra two days will no doubt be appreciated by procrastinators. The Holiday Sale will officially conclude on Monday, January 7, at 10:00 am PST.